FORMER MINISTER FOR communications Denis Naughten was warned that transferring the collection of TV licence fees from An Post to Revenue could devastate the country’s postal network. The Communications Workers’ Union (CWU), which represents employees in the postal, telco and call centre sectors, wrote to the then-minister about its concerns in August. The Oireachtas Communications Committee had previously recommended that the collection of the €160 annual fee be transferred to Revenue to crack down on evasion. In its correspondence, which was released to Fora under the Freedom of Information Act, the union said that it was “seriously concerned” by media reports on the matter. The CWU, which represents more than 80 TV licence inspectors, told the former minister that An Post faces “serious challenges” and that “any decision to reduce this revenue stream will accelerate the deterioration of its finances and services”. “This will place a further burden on the viability of the post office network, which will enhance the business case to close them down,” general secretary Steve Fitzpatrick told Naughten, who recently resigned from cabinet. 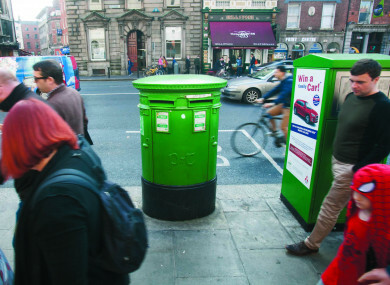 An Post during the summer announced the closure of 159 locations following an agreement with the Irish Postmasters’ Union. The company recorded an operating profit of €8.4 million in 2017 following 2016′s €12.4 million loss. TV licence sales accounted for just €1.46 million of its €840 million annual turnover, and the semi-state has since returned to profit following a cost-cutting exercise that resulted in more than 330 job losses. The organisation announced in August that it’s axing up to 300 more jobs and is considering moving its current headquarters from Dublin’s iconic GPO building as part of the ongoing shake-up. In the letter to Naughten, Steve Fitzpatrick of the CWU said that TV licence staff had “worked extremely hard” to maintain sales during the years that followed the 2008 recession. “Our members have worked hard in a low-key way during a period of public resistance to USC, property tax and water charges,” he said. Fitzpatrick also questioned the accuracy of the stated TV licence evasion, put at roughly 14% of all eligible households in 2017 by the Department of Communications, Climate Action and Environment. “With regard to claims, primarily by RTÉ, the union does not accept the level of evasion is as high as 14%, nonetheless, the union has assisted An Post in its efforts to maximise TV licence sales, achieving its sales target for 2018,” he wrote. In the letter to Naughten, Fitzpatrick also voiced the CWU’s frustration over the fact that An Post cannot access subscription data of cable and satellite TV providers, which he said “has greatly impeded the necessary improvement in collection”. He also complained that, unlike in the UK, the legislation doesn’t extend to households that access television content through other devices such as laptops. Denis Naughten resigned as communications minister following revelations about his private meetings with the head of the only bidder still in the running for the National Broadband Plan. Email “The government was told that shifting TV licence duties to Revenue would crush post offices”. Feedback on “The government was told that shifting TV licence duties to Revenue would crush post offices”.